While Flash has long been a popular vector for malware, last week’s security breach of surveillance software firm Hacking Team underscored just how vulnerable Flash can be. Hacking Team was relying on at least three unpatched Flash exploits, which cybercriminals immediately adapted for their own nefarious uses. Adobe is scrambling to patch the exploits, but at least one remains unfixed as of this writing. A few years ago, this news would have been deeply distressing, as Flash was still the go-to plug-in for video services like YouTube and Netflix, music sites like Rdio, and online gaming portals like Newgrounds. But as HTML5 has improved, and web browsers have embraced it as a standard, it’s becoming easier than ever for web developers to leave Flash behind. All of the sites I just mentioned—and many more—now work just fine without Adobe Flash Player installed. 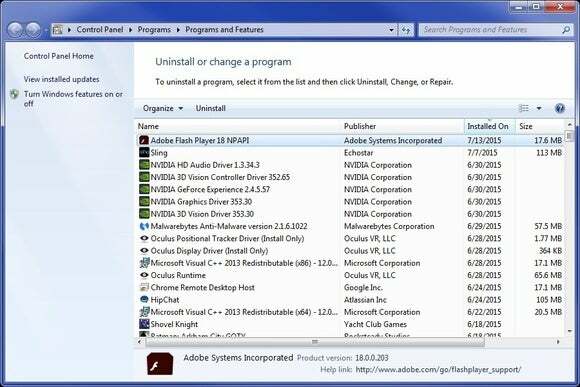 It’s gotten to the point where tech influencers are now calling for Adobe to kill Flash entirely, but why wait? Even with occasional site that doesn’t work—Spotify’s web player is one notable example—disabling or removing Flash from your system is worth the trade-off today. While some browsers such as Google Chrome and Apple Safari use sandboxing to minimize security risks, disabling Flash can also make your system faster and more battery-efficient as websites are no longer bogged down by Flash-based advertisements. Flash just isn’t worth the trouble anymore. 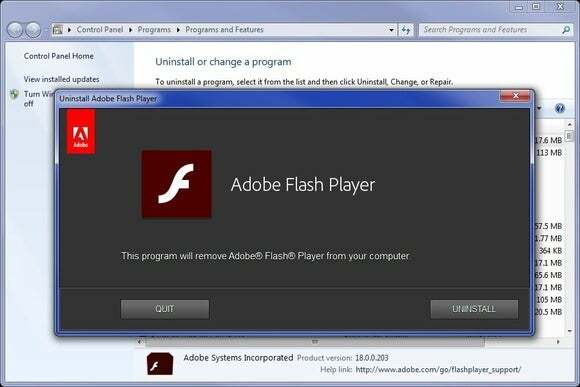 Getting rid of Flash is a fairly simple process. Just open the Start menu (or Start screen in Windows 8), type “Programs and Features” into the search bar, and hit Enter. 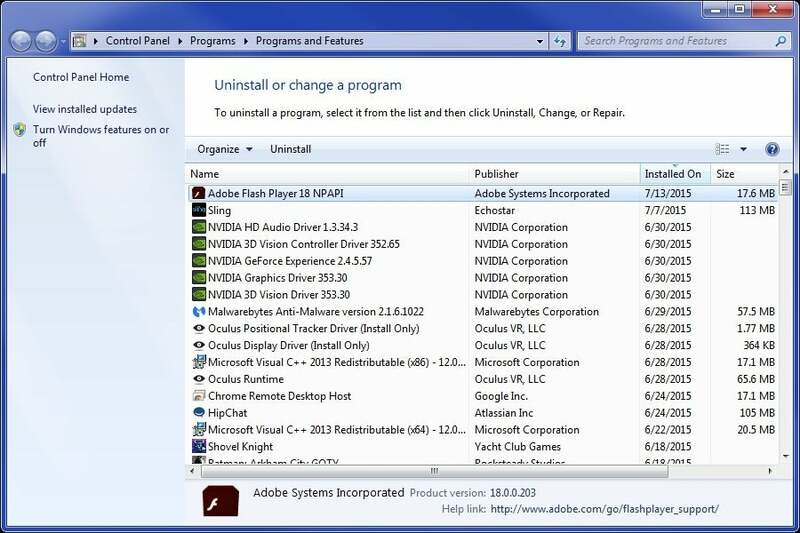 Find “Adobe Flash Player” in the program list, and double-click to open the uninstall dialog. If you’re using Google Chrome, the browser also includes a built-in version of Flash Player. It’s more stable and secure than the desktop version, but still wasn’t safe enough to evade the exploits Hacking Team had been using. To shut it down, type chrome://plugins into the address bar, then click “Disable” under Adobe Flash Player. 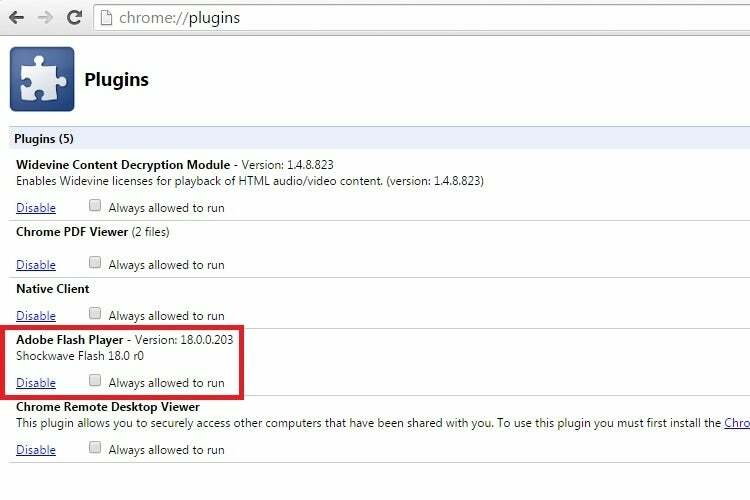 You may want to bookmark the chrome://plugins page in case you run across a website where you absolutely must use Flash—you can briefly reactivate it, then disable it again afterward.